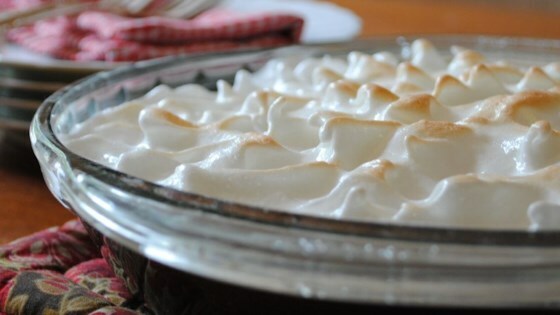 "A rich, creamy chocolate pie reminiscent of old-fashioned Southern home cookin'!" Sift together the cocoa powder and the flour and pour them into a saucepan. Whisk the egg yolks and 1 1/3 cups sugar. Gradually add the evaporated milk, whisking constantly; slowly pour the milk mixture into the saucepan, whisking until combined. Cook over medium heat, stirring constantly with a flat-bottomed wooden spoon or spatula, until the mixture begins to thicken and coats the back of the spoon, about 15 minutes. Remove the custard from the heat and stir in the butter until melted. Pour the filling into the baked pie crust. To make the meringue topping: Combine the egg whites and cream of tartar in a clean glass or metal bowl; beat with an electric mixer until foamy. Gradually add sugar, a tablespoon at a time, continuing to beat until stiff peaks form. Lift your beater or whisk straight up: the egg whites will form sharp peaks. Spread the meringue over the chocolate filling. Bake in the preheated oven for 10 minutes, or until the tips of the meringue peaks are golden brown. See how to make the sweet, nutty pie that's a true Southern staple. A very sinfully delicious pie.. Hint: The longer you cook the filling, the thicker and fudgier it will be.